"A very moist and delicious brownie. Using German chocolate cake mix as a basis for the recipe, makes it virtually foolproof." In a large bowl, beat together the eggs, oil and vanilla until well blended. Stir in the walnuts and cake mix until smooth. Spread evenly into the prepared pan. Bake for 15 to 20 minutes in the preheated oven, until a toothpick or knife inserted into the center, comes out clean. Cool in pan on a wire rack and cut into squares. I used a box of Devil's food cake mix. 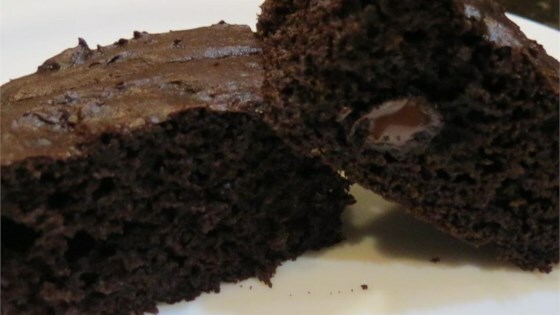 Very great brownies recipe! I made this recipe using a super moist yellow cake mix and chocolate chips in place of nuts. A definite keeper. These were fast but powdery instead of moist. I will stick to my from scratch recipe instead.